What’s next for Timeless? At Comic-Con this week, executive producer Eric Kripke discussed the future of the NBC TV show and the network’s cancellation mistake, Deadline reports. 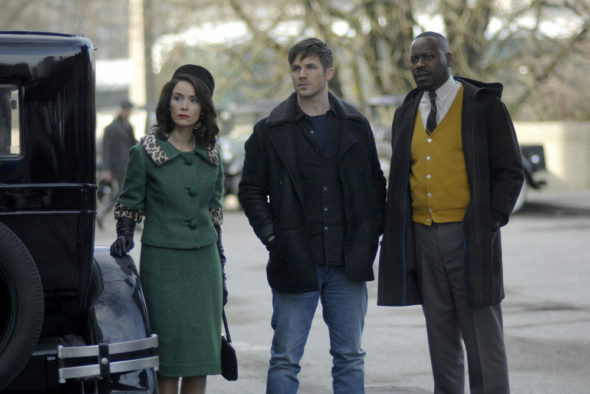 An action-adventure drama, Timeless follows the unexpected team of a history professor (Abigail Spencer), a soldier (Matt Lanter), and a scientist (Malcolm Barrett) as they embark on the adventure of a lifetime to stop a villain from destroying America by changing the past. The cast also includes Goran Visnjic, Paterson Joseph, Sakina Jaffrey, and Claudia Doumit. In May, NBC initially announced they had cancelled Timeless after its first season. Then, a few days later, reversed the decision, ordered a 10-episode second season for the 2017-2018 season. What do you think? Did you see season one of Timeless? Will you watch season two? I watched Season 1 and fell in love with the storyline and the characters. I was sad when I heard it had been cancelled, thrilled when I heard it had been renewed, and a little sad to hear there will only be 10 episodes. I love the characters and love the history. And the Rittenhouse arc is great. There’s a lot to explore with that. And I ship Lucy and Wyatt! Love the show, so glad they picked it back up!! There’s a lot of possibilities with this show so hopefully they keep it going for a while!! Love Timeless. Great characters, riviting storyline and great plot twists. Yes I will watch Timeless. Anxiously waiting for the new season. Hope it goes on for at least 5 years.